I tried to use up the entire tank of fuel, I really did. I drove aggressively, took the car everywhere I went, and even took an extra five-hour trip, but no luck. As much as I drive, it’s normally not a problem to use up a tank or two of fuel in our test cars weekly, but the 2010 Volkswagen Golf TDI makes it hard. After all, over that five hour trip I averaged 57 mpg – this thing is unbeatable on the highway. 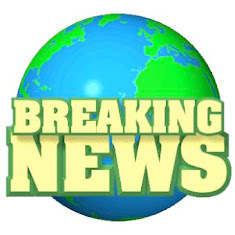 In a world of hybrid-electric cars, you’d think anything that gets over 40 mpg would be slow and boring to drive, but that’s another place where diesel has an advantage over hybrid and gasoline-powered cars – gobs of torque available at will. The compact hatchback segment has always been huge in Europe, but it’s yet to really catch on here in the States. 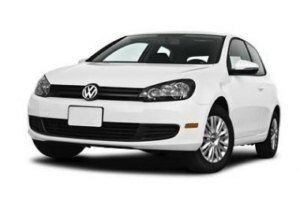 When Volkswagen brought the Golf to the US in 1975, they called it the “Rabbit,” to convey its light, nimble, and quick nature. 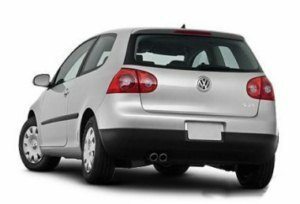 Ten years later, they gave up on the Rabbit nameplate, renaming it to the original “Golf.” In 2006, VW tried the Rabbit name yet again, but apparently it didn’t pan out like they had hoped; for 2010 the compact hatch is back to being called “Golf.” Confusing, I know. 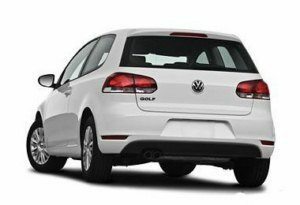 But this year, it’s not just the name that changes – now in its 6th generation, the 2010 VW Golf is completely redesigned inside and out. Although it carries over last year’s (the Rabbit’s) 2.5-liter five-cylinder engine, this year we get the choice of the excellent 2.0-liter turbodiesel inline four cylinder engine from the Jetta TDI. 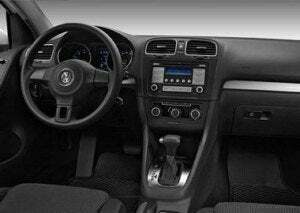 Our review car is a 2010 four-door Golf TDI with the standard six-speed manual transmission. 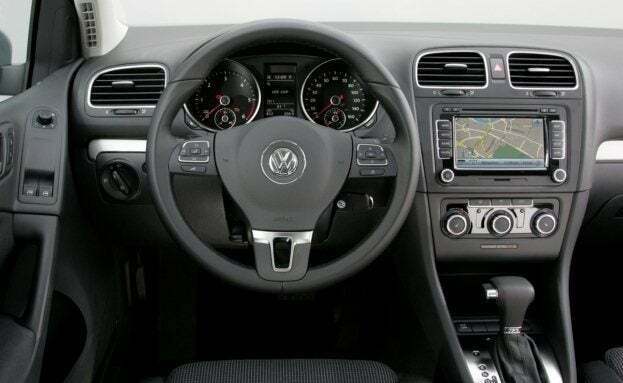 Optional on the TDI is Volkswagen’s six-speed automatic DSG dual-clutch gearbox for an extra $1,100 – the DSG is a great transmission…for an automatic. 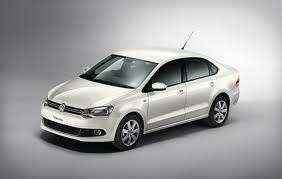 The base Golf gets a standard six-speed auto and an available 6-speed manual for the 2-door model only. I happen to fancy rowing my own gears. Yeah, I think “huge improvement” is an understatement. 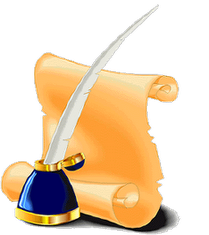 And pricing? 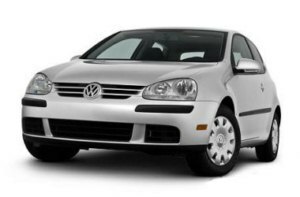 The 2010 Golf starts at a reasonable $17,620 for the 2-door hatch with 2.5-liter gas engine. Bump it up to the diesel-powered TDI and you’re starting at $22,354. Don’t worry, you’re not paying $4,700 for a different engine; the TDI comes standard with much more equipment, too. Along with that torquey and fuel-efficient turbo-diesel motor, you’ll get standard 17-inch alloy wheels, bluetooth, fog lights, a sporty suspension, and a touchscreen interface with CD changer, an iPod interface, and satellite radio. Options on the TDI include HID headlights, premium sound, and a hard-drive navigation system. If you want the four-door Golf TDI, you’ll need to pony up an extra $1500 or so. 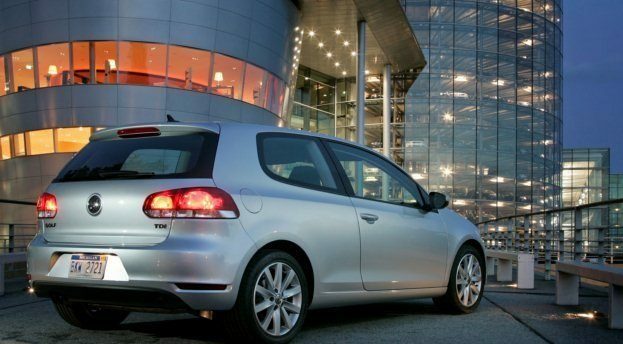 Something to keep in mind – the base Golf doesn’t get most of that stuff – even as an option – it’s for the TDI only. The diesel-powered Golf TDI with manual transmission gets a 30 mpg city, 41 mpg highway rating from the EPA, but it’s easy to get more than that, especially on the highway. Opt for the DSG gearbox and the hwy economy gets nudged up to 42 mpg. 140 horsepower and 236 lb-ft of torque gets the car from zero to 60 mph in 8.6 seconds, although it feels much faster than that. The Golf’s major competition is the Mazda3. And as much as I like the Golf, the Mazda3 is a great car; I’d have a problem choosing. Other competition is loosely defined, but you might want to cross-shop the Subaru Impreza, Honda Fit, and MINI Cooper. 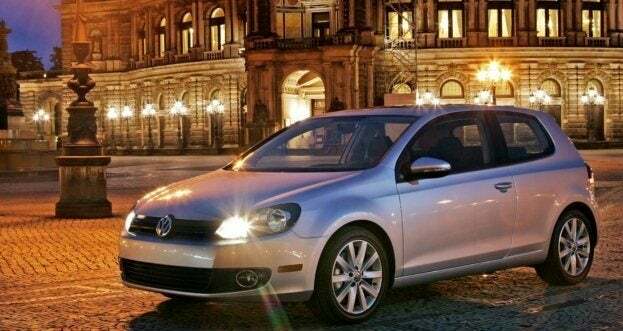 None of them, however, offer a diesel option, so if you’re looking for fuel economy in your hot hatch, the 2010 VW Golf TDI is the way to go.